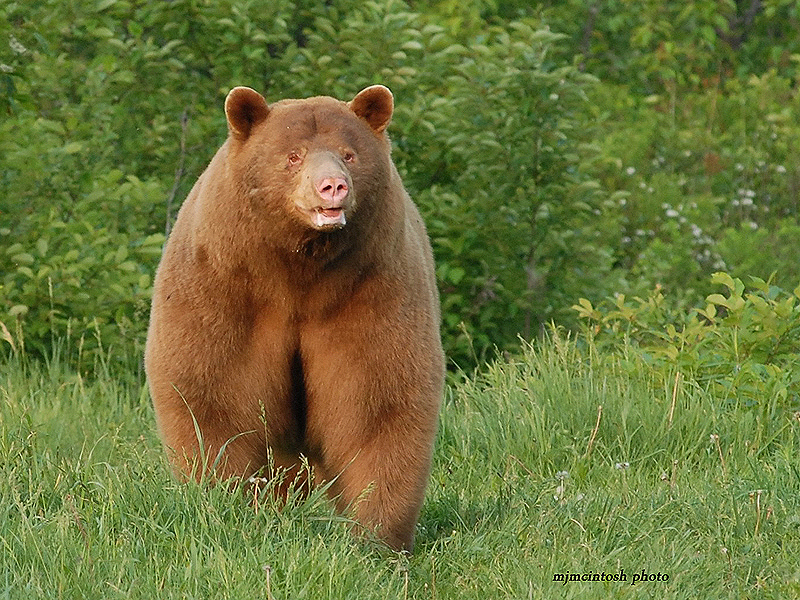 The North American Black Bear – A bear of several colours. 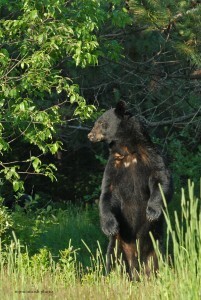 Black bears come in more colors than any other North American mammal. They can be black, brown, cinnamon, blond, blue-gray, or white. East of the Great Plains, the colour black is the most common. 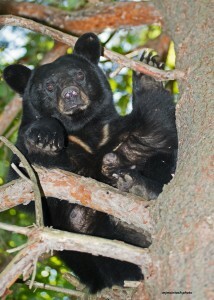 These were the first bears early settlers saw, hence the name. The melanin in black fur makes the fur resistant to abrasion in the brushy understory of eastern forests. In forested states that border the Great Plains, 5% to 25% are shades of brown rather than black. About 5% are brown in Minnesota. Blond or white individuals are rare in Minnesota, but a young white male was seen near Orr, MN, in 1997 and 1998. 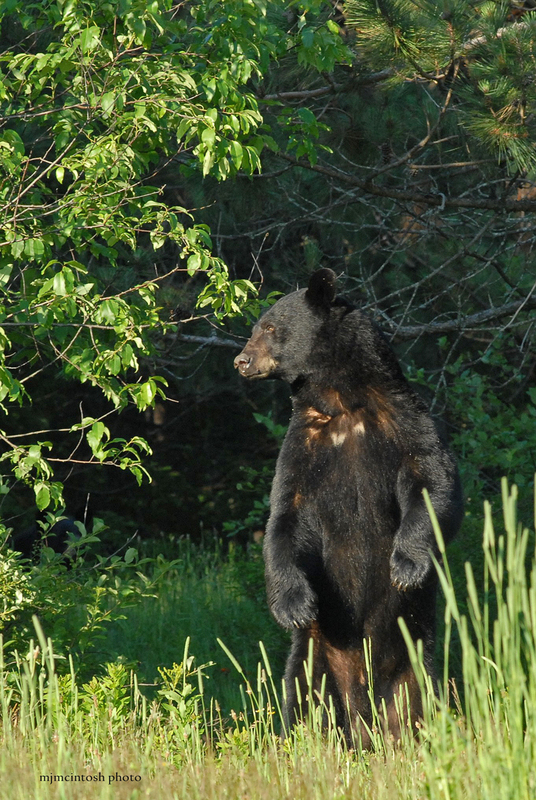 In western states that have mountain meadows and open park-like forests, over half the black bears (Ursus americanus cinnamomum) are brown, cinnamon, or blond. 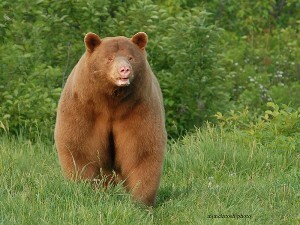 Light colored fur reduces heat stress in open sunlight and allows the bears to feed longer in open, food-rich habitats. Some non-black black bears bleach in the sun. New dark brown fur can bleach to nearly blond by the time it is shed the next summer. Two rare color phases are found in coastal British Columbia and southeastern Alaska where populations are isolated by mountains. The Kermode bear, a subspecies of black bear (Ursus americanus kermodei), lives on a few islands along the coast of British Columbia. Most of them are black, but in some areas up to 20% are creamy white and called Spirit Bears. Farther north, another subspecies, the Glacier Bear (Ursus americanus emmonsii), lives in southeastern Alaska. Again, most are black, but a few are dark bluish gray with silver-tipped guard hairs. Mountain glaciers that isolated this subspecies during the Ice Age are now gone or greatly reduced. The subspecies is now only semi-isolated from surrounding populations. As these bears integrate with surrounding populations, dominant black genes will make the rare blue-gray color phase even more rare. 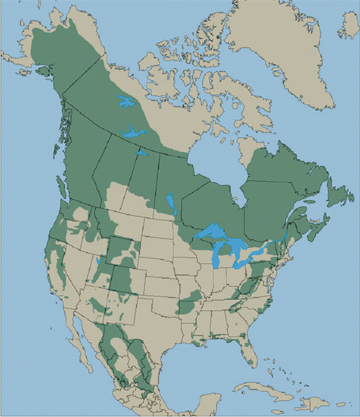 Black bears historically ranged over most of the forested regions of North America, including all Canadian provinces, Alaska, all states in the conterminous United States, and significant portions of northern Mexico (Hall 1981). Their current distribution is restricted to relatively undisturbed forested regions (Pelton 1982; Pelton et al. 1994). Diagram note: The diagram on the left indicates the bears former home range. The diagram above is the current range as calculated in 1995. 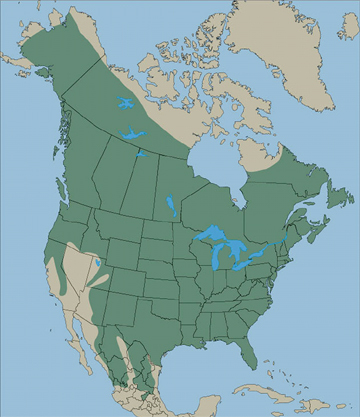 Black bears can still be found throughout Canada with the exception of Prince Edward Island (extirpated in 1937), and in at least 40 of the 50 states; their status in Mexico is uncertain (Leopold 1959). In the eastern United States black bear range is continuous throughout New England but becomes increasingly fragmented from the mid-Atlantic down through the Southeast (Maehr 1984). In the Southeast, most populations are now restricted to the Appalachian mountain chain or to coastal areas intermittently in all states from Virginia to Louisiana (J. Wooding, Florida Freshwater Fish and Game Commission, unpublished data). 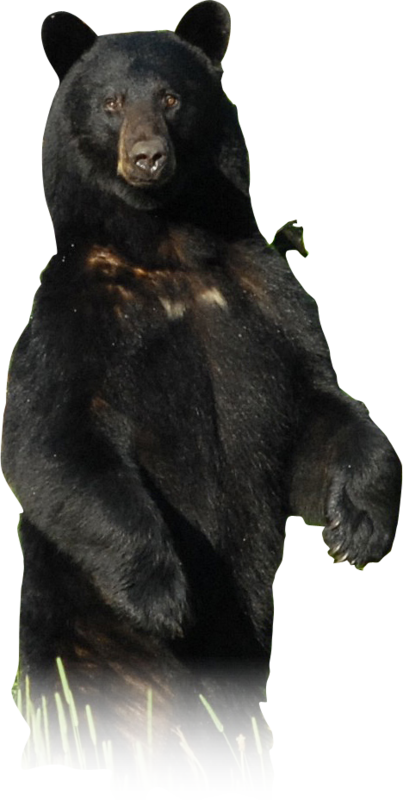 Taxonomists currently separate black bears into 16 subspecies based on minor differences in appearance and DNA. 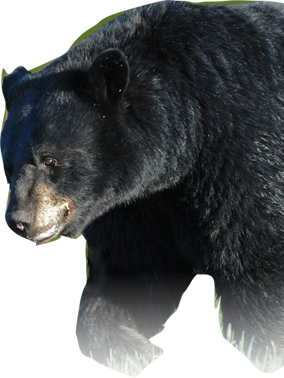 Some of them have common names like Kermode bear, cinnamon bear, and glacier bear, but they are all black bears. Credit – text – Dr Lynn Rogers, www.bear.org.